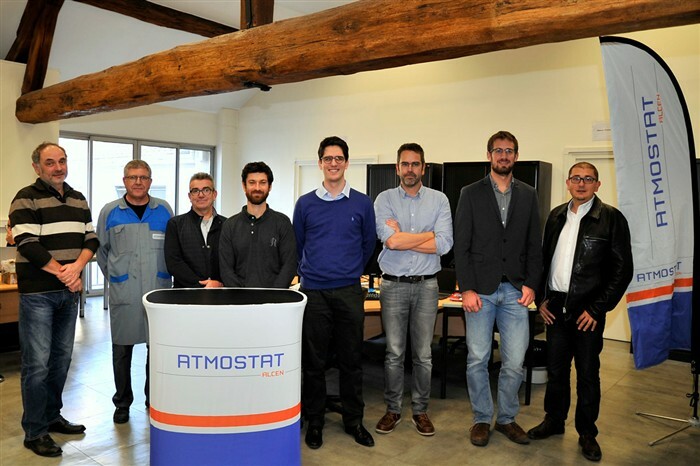 The F4E-ATMOSTAT team which has ensured the qualification for the fabrication of the Electron Cyclotron (EC) Upper Launcher Blanket Shield Module. The four ITER EC Upper Launchers will each inject up to 8 MW microwave power into the ITER machine in order to aide plasma initiation and counteract plasma instabilities during the time the fusion reaction takes place. The plasma-facing structural part of the Upper Launchers is called the Blanket Shield Module (BSM) which is made up of several parts joined together by different welding techniques. The BSM will be heated up to approximately 350°C during ITER operation, thus necessitating a state of the art cooling system. In addition, since the BSM will be fully immersed in ITER's Vacuum Vessel, which is an ultra-high vacuum environment, its metal joints must be of the highest quality. Schematic view of the EC Upper Launcher Port Plug (right) and the Blanket Shield Module cooling water circuit (left). F4E, together with the French company ATMOSTAT, are working together to enhance the BSM cooling performance. Their joint efforts have resulted in improving the cooling of the flange part by refining the initial channel design. This was ensured using Hot Isostatic Pressing technologies (HIP - a method that involves pressure used to compress the metals together homogenously from every direction), with a more uniform repartition of the water channel within the flange and the definition of a manufacturing route suited for the new water channel geometry. HIP technologies allows materials to be bonded together by forming a metallurgical bond with diffusion bonding occurring on an atomic level, extending the lifetime of critical components which are subjected to extremely high temperatures and therefore allowing the BSM to comply with the requirement of surviving the entire ITER operational lifetime. A pre-production mock-up shows a good CuCrZr-Stainless Steel bonding quality and no internal channel deformation. During the HIP process stainless steel and Copper-Chromium-Zirconium alloys are bonded by simultaneously applying high pressure, equivalent to 10 km under the sea, and high temperature, similar to that of the earth at a 40 km depth. The joining is performed in special pressurised furnaces during a long and strictly controlled process. A heat treatment is applied, as a last step, to recover the material structural properties. This final treatment, intended to modify the crystalline structure of the metals, consist on a rapid cooling followed by a low temperature plateau. To ensure the quality of their HIP process ATMOSTAT has completed a successful qualification process which included mechanical tests, ultrasonic testing and macrophotography on numerous specimens. In addition, this HIP process has also received the stamp of approval from a "Notified body" accredited by the French Nuclear Safety Authority (ASN). It was also confirmed that the BSM internal geometry was not deformed after HIP, despite the high amount of pressure that the metals had been subjected to, achieving one of the main goals of this development programme: to develop a manufacturing route to build the complex cooling geometry of the BSM. "The qualification approval is the culmination of six months of intense testing in order to ensure that the BSM prototype will be of the highest quality and will function well. We are happy that the results of the testing were so successful. This means that we are on track for the manufacturing of the full-scale BSM prototype, which is expected to be finalised during next year. This is an important milestone for which we have been working very closely with our colleagues at ITER IO in order to ensure that will be achieved on time" says Jose Pacheco, F4E Technical Officer dealing with the BSM.